Graf Wilhelm zu Schaumburg-Lippe is shown here with three allied artillery officers. The Graf was the ruler of a tiny state allied to Britain and he supplied the alliance a single battalion of infantry, a handful of cavalry and jaegers and, most importantly, a major artillery park as well as his personal expertise in this field. Artillery was his personal hobby and he established a specialist training school within his territory. Eventual his artillery train grew to 29 x 3-pdr, four x 8-pdr, two x 12-pdr, three x 18-pdr cannon, three howitzers and four heavy mortars. Given his rank and the fact that he was the son of an illegitimate daughter of King George I, he often commanded allied artillery on the battlefield. 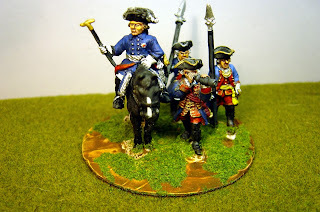 I've used a Fredrick II figure from Front Rank as I've seen the Graf portrayed in a very plain blue coat and there are physical similarities in their faces. Figures are a mix of Front Rank, Foundry and Crusader. 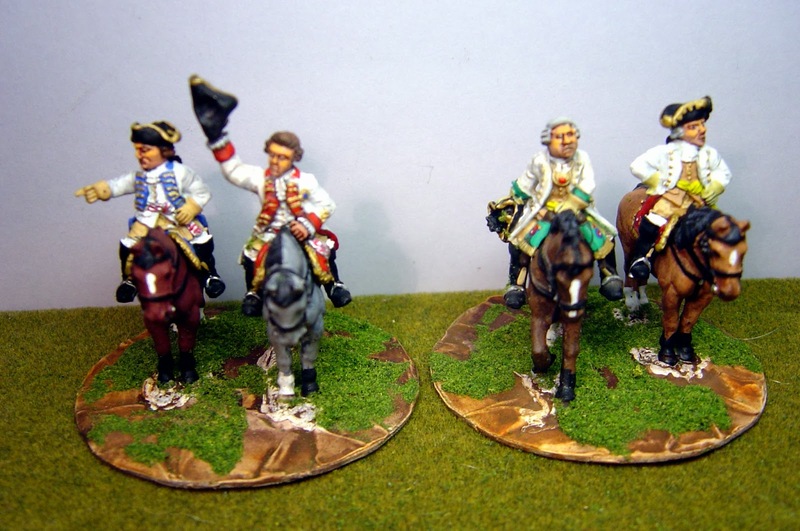 Here are two bases of cavalry lieutenant-Generals. 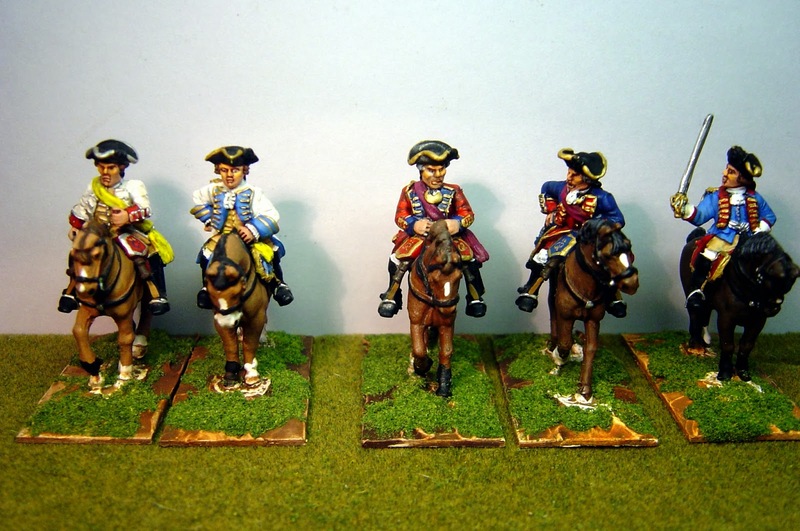 On the left, a Hessian set, and on the right a Hanoverian group. Neither state had a regulated uniform for generals in this period so they all wear cavalry regimental uniforms (of Horse) – white coat with assorted coloured facings, Hessians with lapels, Hanoverians without. Figures are a mix of Front Rank and Foundry. Hodenburg, a Hanoverian Major-General of cavalry and Busche, another Hanoverian Major-General of cavalry (in Dragoon uniform). 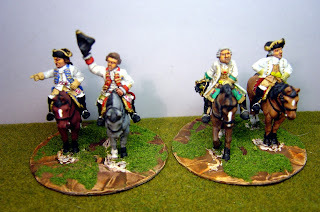 These are followed by two British officers – an Infantry Major-General and an Artillery major. 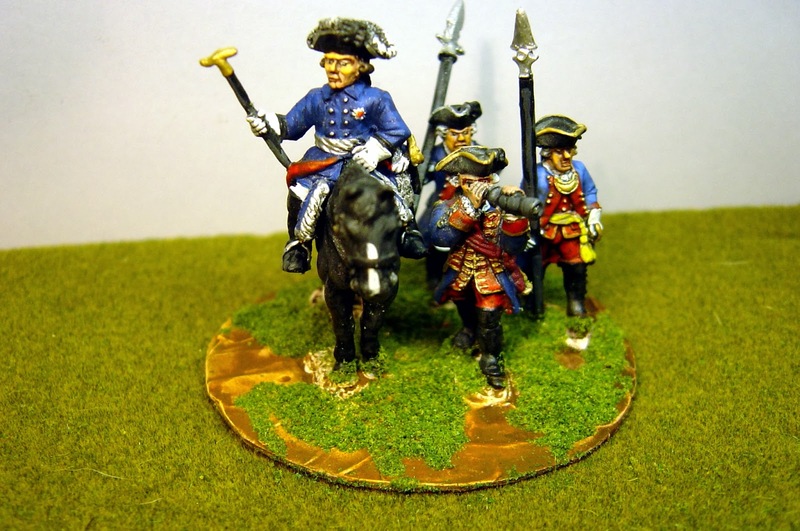 Lastly there is Einsiedel, a Hessian dragoon Major-General. Figures are a mix of Front Rank and Foundry. Wonderful! 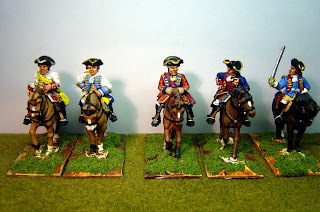 One can never have too many mounted officers and generals in the collection and on the table. Stunning work! The various makers blend in well together.